NDT International, Inc provides Non-destructive testing equipment and professional services to help companies like yours apply state of the art quality control inspection, preventive maintenance, Ultrasonic testing and their many accessories. Call us and speak with a real live person in the USA who has knowledge of our products and can direct you to the proper equipment. At NDT International our focus is on how applied, technical and industrial technology can increase the success of your organization or business. A manufacturer may need to know the quality of products off their assembly line for better quality control using our ndt equipment. Industrial non destructive testing can help prevent major breakdowns with the higher level of preventive maintenance that ndt inspection tools and equipment provide. Hardness testing, concrete testing, metal thickness gauges...no matter what the material, there is ndt inspection equipment to help you get the best results. We offer numerous models of ultrasonic thickness gauges, including simple ultrasonic thickness gauges for the basic inspection of tanks and piping systems to very complex ultrasonic thickness gages with data loggers and multiple scan modes. 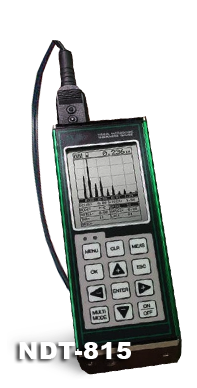 We offer a range of ultrasonic flaw detectors from a simple flaw detector for basic ndt inspections to complex ultrasonic flaw detectors with memory, and flaw evaluation algorithms. NDT International is a premier source of professional non destructive testing equipment and quality control instruments from the world’s leading manufacturers. We provide high quality ndt inspection instruments commonly used for protective coating thickness measurement, automotive paint inspection, quality control, preventive maintenance and environmental testing. We know the importance of providing the ability for proper calibration and quality control of measurements with quality equipment to ensure confidence in the measurements you need for your business. We are capable of meeting nearly any non destructive testing need, whether it is equipment, consulting or inspection services, supplies, or accessories. If you have any questions, need specific information on any of our products, or want to discuss a project or problem, please feel free to contact us at any time. We look forward to hearing from you and hope that we may soon become a valued supplier of non destructive equipment, accessories and services for your company. 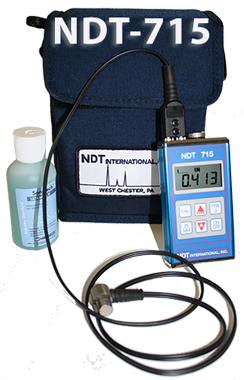 NDT International, Inc Ultrasonic Thickness Gauges. Below are just some of the products and services NDT International can provide. NDT INTERNATIONAL INC. 711 S. Creek Road, West Chester PA 19382-8013 U.S.A.
Instrumentation, Supplies and Technical Services for the Non Destructive Testing Industry since 1971.